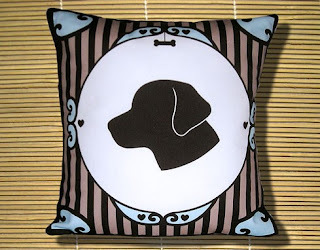 We recently had the chance to review a gorgeous pillow crafted by the multi-talented artist, Deborah Mix. "Pillows are printed professionally on upholstery weight fabric, sewn together by Deborah and stuffed with Polyester fiberfill. The square pillows have a flap in the back so that the pillow form can be removed for cleaning. They can be hand washed and ironed. 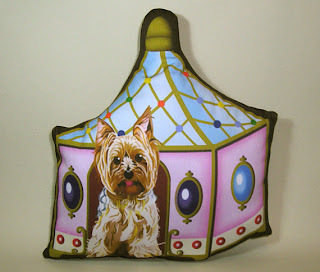 Yorkshire Terrier in jewel box, and the Tabby Princess pictured above. About Deborah Mix: Deborah is a graphic designer, computer artist and needlepoint artist. She also has a dog grooming practice, which certainly keeps her on her toes. Most importantly, Deborah is a pet parent who draws on inspiration for her designs from her four fabulous felines and one "obnoxious" little canine. Together with her pets, she lives in New York City." What we thought: This pillow was really gorgeous! It added a feminine and classy look to A's bed and she loves it! The pillow if very well-made and I love that the cover is removable and washable. 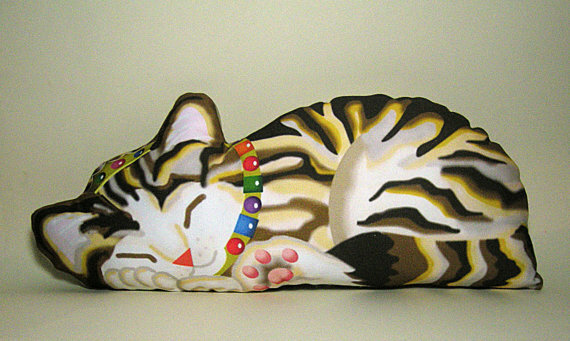 Deborah Mix is super creative and these pillows are really lovely. The silhouette pillows are whimsical and stylish and the Spoiled Brat pillows are super fun and colorful. These pillows would make fantastic gifts for the pet lover in your life, so keep Deborah Mix in mind when you make your holiday gift lists:) ABCD Diaries gives these wonderful pillows an A+! Buy It: These fabulous pillows and more can be found in Deborah Mix's Etsy shop which can be found here.